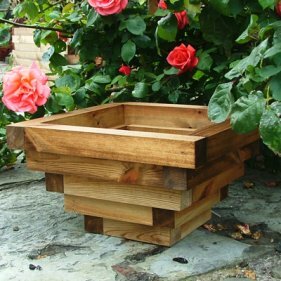 At 40cm wide and 25cm high this smaller wooden outdoor planter could be used as an indoor planter. It is made from lengths of 4.5cm x 4.5cm planed Scandinavian red pine which are fixed and glued and finished with a good quality, plant friendly preservative in either clear or golden brown as shown here. The internal walls of these planters are now painted with a waterproof paint sealant. Tomatoes are one of the most adaptable planter plants. You can grow dwarf or bush varieties in window boxes or around the edges of planters. Bush tomatoes are happiest in planters at least 30cm square, a planter 45cm square can accommodate three plants. Tomatoes grown on a single stem as cordons will need tying to a stake as they grow. 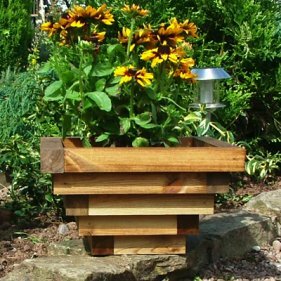 Or position the planters near a wall or fence and tie the plants to a fixed trellis. This is probably the best way of training the long stems of a cucumber, too, although some outdoor varieties, such as ridge cucumbers, can be left to trail over: the side of the planter. by frost. If you are growing from seed, this can be sown direct into the planters outdoors when the temperature starts to rise in spring and there is no further risk of frost. But you may find it easier to raise seedlings indoors or buy young plants. Again, plant out after the last frosts. may rot. If you are training cordon tomatoes, pinch out the side shoots as they appear. Bush tomatoes and cucumbers should be left to grow naturally, leaving the side shoots intact. Harvest tomatoes regularly, once the fruit is ripe. Cucumbers should be gathered young to maintain a steady supply. You can also raise salads in planters to pick regularly through several months of the year if you choose cut-and-come-again varieties. Pick off a few leaves at a time and allow the centres to grow on to supply a succession, of new leaves. The most important things to remember are watering and feeding. The compost should never be allowed to dry out and, once the crops start to develop, a weekly feed of a general purpose liquid or soluble plant fertiliser should be applied to keep the plants growing strongly.